Celebrate Religious Diversity Every Day with the 2019 InterFaith Calendar! The 2019 InterFaith Calendar is a spectacular 14" x 22" full-color, twelve-month, wall calendar produced with the cooperative effort of 17 religious communities. 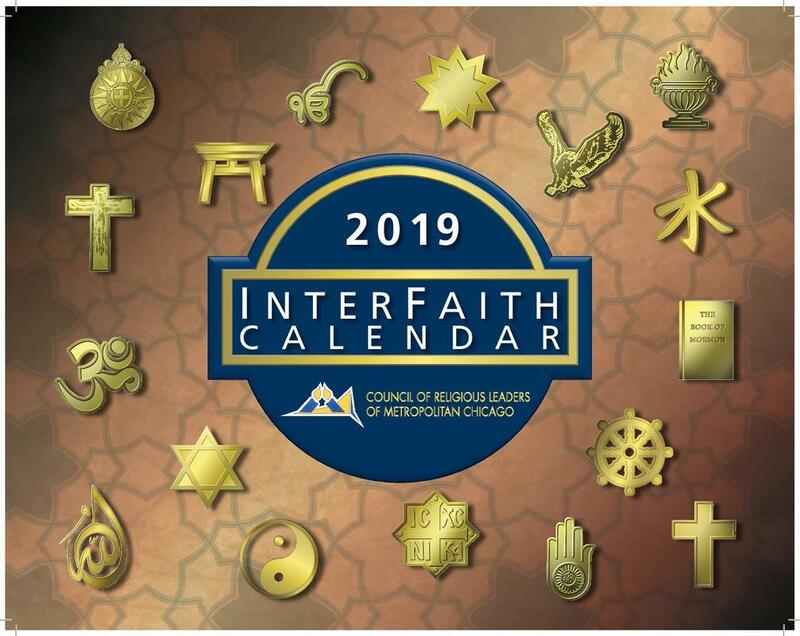 The 2019 InterFaith Calendar features a listing and explanation of religious observances for 17 different faith communities. It also includes summaries of the basic beliefs, practices, religious writings, art, and demographics for each faith community. The 2019 InterFaith Calendar is an an invaluable tool for businesses and corporations, schools, government facilities, and civic and religious organizations in today’s diverse society. Join the Council of Religious Leaders of Metropolitan Chicago in an interfaith celebration of this most American holiday. ​Hosted and co-sponsored by the Chicago Temple at First United Methodist Church, the Interfaith Thanksgiving Observance features music and prayer offerings from more than a dozen faith communities in Metropolitan Chicago. There is no charge to attend and the public is invited. ​Please remember our neighbors in need during this season. Congratulations to the 2018 Interreligious Leadership Award Recipients! ​The Council of Religious Leaders of Metropolitan Chicago is horrified by the vicious antisemitic murders at Tree of Life Synagogue in Pittsburgh. We remember with bitter sorrow the Shabbat morning worshipers killed and injured in this attack, and we honor the police officers who were wounded while coming to their aid. We pray for comfort and hope for the families and friends of those affected by this act of hate. But we are also outraged. We are outraged by the increasing normalcy of racist violence in a sacred space. The victims at Tree of Life join the victims at the Sikh gurdwara in Oak Creek, Wisconsin and at Emanuel African Methodist Episcopal Church in Charleston, South Carolina. We are outraged by the frequency of such violence. Tree of Life is the 294th mass shooting in the United States this year. Almost 12,000 people -- including 441 in Chicago -- have died from gun violence in 2018. And we are outraged by the regularity of our reactions. All of us -- news networks, first responders, political leaders, and yes, faith leaders -- know just what to do following a mass shooting. We follow a script, we mourn the dead, and we move on. But we are past the time for mourning without meaningful response. Placing armed guards in America’s more than 300,000 religious congregations is not the answer. Churches, temples, mosques, and synagogues already have taken steps to “harden” their security, and the injuries to police officers in Pittsburgh show that even trained responders are at risk. This strategy mistakes the effects of gun violence for its means and sources. We need a different path. We call on the President of the United States and leaders at every level of our society to remember that their words matter. Pittsburgh reminds us that the rhetoric of violence begets violence. Everyone has the moral responsibility for what they say. For our part, we will convene meetings in congregations across this region on ways to reduce the potential, frequency, and lethality of gun violence. We welcome people from across the political spectrum. Our only condition is that participants share a commitment to strategies and outcomes that reduce gun-related deaths and injuries. The Council of Religious Leaders of Metropolitan Chicago, representing more than 30 religious communities in this Region, endorses the consent decree between the State of Illinois and the City of Chicago regarding the Chicago Police Department. We share the Agreement’s goals to strengthen respect for the rights of the people of Chicago, to build trust between CPD officers and the communities they serve, and to promote both officer and community safety (§2). We embrace the Agreement’s dual commitment to the rights and needs of both the residents of all communities in Chicago and the officers sworn to serve and protect them. We endorse the Agreement’s commitment to Community Policing (Part II) and Impartial Policing (Part III). We further support the commitment to providing “police services to all members of the public without bias and will treat all persons with the courtesy and dignity which is inherently due every person as a human being without reference to stereotype based on race, color, ethnicity, religion, homeless status, national origin, immigration status, gender identity or expression, sexual orientation, socio-economic class, age, disability, incarceration status, or criminal history” (§50). We endorse the Agreement’s delineations regarding Use of Force (Part VI) and the renewed emphasis of CPD on de-escalation as a core principle. This commitment affirms that the rights and very lives of every Chicagoan matter and will be respected. We agree with the proposed guidelines for using force and for reporting the use of force by officers on duty. We also endorse the Agreement’s commitment to Officer Wellness and Support (Part IX). In an era when our city faces a renewed surge in gun violence, we have an obligation to support those in public service who suffer the moral, emotional, and physical challenges of upholding the law under demanding and frequently dangerous circumstances. Finally, we endorse the Agreement’s many proposals for Accountability and Transparency (Part X). We believe that trust between the community and police is the foundation of effective policing. The Agreement’s consistent emphasis on documentation, reporting, and analysis is a necessary step in service to more effective, more transparent, and more accountable policing. The Council supports this Agreement as a necessary mechanism for advancing these goals. The rights of ordinary citizens, the needs of police officers, and the welfare of our communities cannot be a matter of simple bargaining. The Agreement offers an essential catalyst for implementing these recommendations and a neutral standard for measuring their effectiveness. Our Council was founded more than 30 years ago to improve the quality of our collective spirit at a time of great polarization in this city. We believe that this Agreement represents an opportunity to create the necessary trust, transparency, and accountability that are essential if we are to overcome such divisions in Chicago today. We pray that it inaugurates a time of change and hope for the benefit of us all. The Council of Religious Leaders of Metropolitan Chicago will hold the 2018 Interreligious Leadership Awards Reception on Thursday, November 8, 4:40-6:30 PM. The Interreligious Leadership Award is given each year in recognition of those individuals, programs, or organizations that embody the Council's goal of promoting religious harmony in our community in service of the common good. The Illinois Council against Handgun Violence (ICHV) s the oldest and largest statewide organization in the United States working to prevent the devastation caused by firearms. ICHV successfully advocates for policies designed to minimize the impact gun violence has on Illinois residents, and through their efforts Illinois has some of the most progressive gun laws in the country. CRLMC is a member of the Illinois Handgun Violence Prevention Coalition and honors the sacredness of human life by working to reduce gun violence in our communities. The Reverend Wayne N. Miller is the immediate Past President of the Council of Religious Leaders of Metropolitan Chicago and Bishop of the Metropolitan Chicago Synod of the Evangelical Lutheran Church in America. The Reverend Paul H. Rutgers is Executive Director Emeritus of the Council of Religious Leaders of Metropolitan Chicago, a past CRLMC President, and former Presbyter of the Presbytery of Chicago. The Rev. Dr. Stanley L. Davis, Jr. is Executive Director Emeritus of the Council of Religious Leaders of Metropolitan Chicago and former Executive Director of the National Conference of Christians and Jews (NCCJ). Order Tickets and sponsorships here. Contact CRLMC (773.595.4012) for more information. We hope to see you there! The Council of Religious Leaders of Metropolitan Chicago represents more than 30 religious communities in our Region. Many are watching the trial of Jason Van Dyke for the death of Laquan McDonald. Like you, we are concerned about the community response to the verdict. ​Tina Hunter, mother of Laquan McDonald, has called for nonviolence following the Van Dyke verdict. Emphasize that those who choose violence are deliberately contradicting her wishes and endangering the community. They are responsible for the consequences of their actions. If your congregation has the resources, publicize and announce that you will be a safe place for people to gather and share their thoughts about the verdict. Enable people to express their issues and concerns nonviolently. Encourage planning of nonviolent next steps such as vigils, teach-ins, and forums. Contact your district Commander or local police liaison. Confirm whom you need to contact in case of concerns following the verdict. Ask for their emergency protocol and inform CPD of your congregation’s plans. Request and exchange emergency contacts/phone numbers. Human life is sacred in every religious tradition. Speak from the pulpit against violent responses to the verdict. Amplify this message through your newsletter, your signage, and your congregation’s committees and leadership. Use the power and connections of your congregation to dispel and counteract rumors following the verdict. Interrupt rumors with facts, time, and counter-narrative. The work of healing and justice in our city will continue after the verdict. Together we can renew our commitment to a Chicago that works for all of us. Welcome to the official site for the Council of Religious Leaders of Metropolitan Chicago. Our office is located in Hyde Park, across from Catholic Theological Union. But our presence extends far beyond that residence. As a council, we work to promote peace and unity among all of the respective faith traditions on a local, national, and international scale. Here on this site, you can find important information from past events and for upcoming events, learn more about the members of the Council and the different faith traditions that they represent, and discover ways to get involved with the mission and service of the Council. Please see here for recaps of past events, and here for photos of past events. Watch this space for info on current or upcoming events. Celebrate religious diversity everyday! Order your copy of the 2018 InterFaith Calendar today! We Represent a kaleidoscope of diversity!